The 2012 American Silver Eagle Uncirculated Coin marks the fifth year of the American Silver Eagle Uncirculated Coin program despite the series actually debuting in 2006. These coins were issued annually by the US Mint from 2006 through 2008, then in 2009 production was cancelled owing to demand for the related bullion Silver Eagles with the uncirculated Silver Eagles not returning until 2011. The release date for the 2012-dated version was August 2, 2012. The coin is currently priced by the Mint at $45.95. American Silver Eagle Uncirculated Coins are struck to the same basic specifications as those bullion counterparts, including being composed of one ounce of .999 fine silver with a diameter of 40.60mm. They also feature the same obverse and reverse imagery. The United States Mint initially sells each American Silver Eagle Uncirculated Coin directly to the public. Like other US Mint numismatic products, the cost of the coin contains a significant premium over and above any face or melt values associated with it. That higher value over melt or face typically sticks with the coin and is known as its numismatic value. Numismatic value for a strike is basically what the coin is worth to other collectors. It generally increases based on the condition and rarity of the coin. However, even if collectors were not interested in an uncirculated Silver Eagle, it would always have its melt value associated with it as well since each is struck from one ounce of 99.9% pure silver. Thus, if silver was currently trading for $20 an ounce, each coin would have a melt value of approximately $27 — one ounce times $27 an ounce equals $27. Finally, the US Mint strikes a face value of $1 on each Silver Eagle. This is the value of the coin were it to be used for a commercial transaction and is backed by the government of the United States. As previously stated, American Silver Eagle Uncirculated Coins debuted in 2006 and were struck in the two following years before being cancelled in 2009. Investors were seeking out the related bullion Silver Eagles in record numbers and the Mint diverted all available Silver Eagle planchets towards bullion production, leaving none for the uncirculated Silver Eagle or the Proof Silver Eagle. 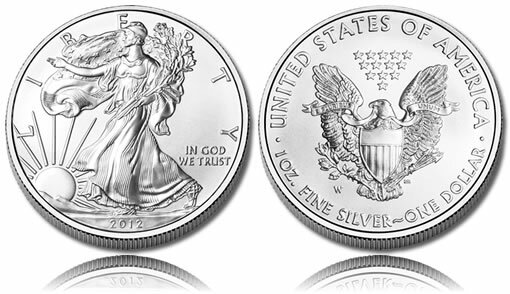 With an increase in available supplies, Proof Silver Eagles made a return in 2010, but the uncirculated Silver Eagles would not appear again until 2011. The obverse of each Silver Eagle contains the same "Walking Liberty" design first completed by Adolph A Weinman for the 1916-1947 Half Dollar. Considered one of the most beautiful designs ever struck on an American coin by many, the image of Liberty is surrounded by the inscriptions of LIBERTY, IN GOD WE TRUST and the year of minting. John Mercanti designed the reverse which shows a heraldic eagle with shield along with the inscriptions of E PLURIBUS UNUM, UNITED STATES OF AMERICA, 1 OZ. FINE SILVER and ONE DOLLAR. The mintmark is also located on the reverse of the strike.